Google+ took off like a rocket. It only took 16 days for the social media platform to reach 10,000,000 users. Now Google+ has launched pages for businesses, organizations, and institutes. What does this mean for the Academic Health Center? Here we see the Google+ page for the University of Florida. As you can see, there are a number of features that are very similar to a Facebook page – you have a wall feed, a photo gallery, a video gallery, and an about page. There are, however, a few unique features to the application that departments and centers would want to take advantage of. Google+ uses a concept called Circles for categorizing the followers for your page. As you post to Google+, you can choose to send a global message to all your circles or to specific circles only if the message you are sending is only applicable to a few audiences. Be aware that In order to add a person to a circle, you have to wait until they have added the page. This will require that you market your page first in order to get the users to build out your circles. Google+ has some initial suggestions on how to market your page. For more on Google+ Hangouts and how they operate, please refer to this page on the subject. The Direct Connect feature allows people to find your business Google+ page by adding a + to the front of their Google search. In order to take advantage of the Direct Connect feature you have to connect your website to your Google+ page. Currently Google+ business pages do not allow for multiple administrators. Google had acknowledges the need for this feature and it is scheduled to be deployed sometime in December. 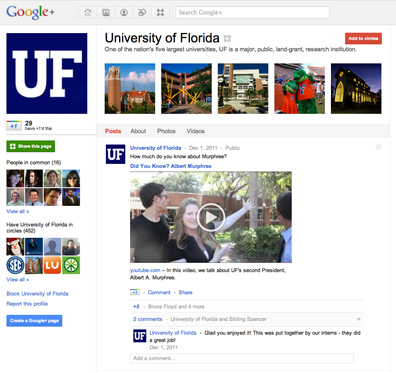 A Google+ page falls under the UF Social Media policy. Before creating a page, a UF department must get authorization for an official university activity must come from the vice president with jurisdiction over one’s unit as well as the vice president for University Relations or his/her designee. Here’s the form for registering your account. And, as always be aware of FERPA and HIPAA regulations and post accordingly. Mashable has a terrific photo gallery of 16 universities that jumped onto the Google + Page quickly. While some of the sites have been built primarily as an admissions and recruiting tool, other have been built primarily as a school spirit tool more in line with bringing content to current students and alumni. As pages progress, expect to see specific targeted admissions pages and individual pages for colleges, departments, centers.